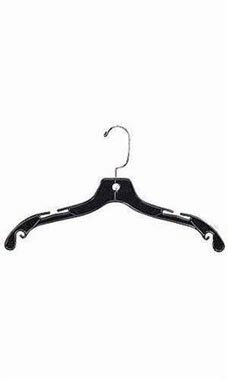 Premium Plastic Dress Hanger - Black - 17"
Dress hangers are the most popular choice of hanger by retailers. In fact, dress hangers have become an industry standard when it comes to clothing. So why not get it at the best value possible? At Store Supply Warehouse, our 17" Premium Black Plastic Dress Hangers feature added elastomers for maximum flexibility, and chrome swivel hooks, which are designed to save space on clothing racks. Additionally, each hanger contains notched shoulders for secure hanging of any style dress or strap, and padded clips. Sold in cases of 100. Good quality hangers. Bought 900 of them. The dress hangers we ordered are perfect for our store! They are sturdy and look nice. Plus the order came very quickly! I ordered these hangers for my boutique. They are perfect. Great quality and they look good. I wasn't sure what to expect when I ordered these hangers but I was very surprised when they arrived. The are thick and sturdy plastic so they can be reused many times. Great quality for the price. Hangers arrived neatly packed and with no damage. They are nice and sturdy. Ordered two boxes for my boutique and have more on the way! Great quality and value!! I just submitted a bad review of these hangers but meant to send it to a different company. Sorry about that. These hangers are very good. I have ordered this hanger several times and I have never been disappointed. These hangers and durable and decent looking. Very reasonable price also. Have ordered these several times in the past. They are good, sturdy hangers. Perfect for multiple types of clothing, heavy or light weight. The hangers are strong and some of the best I have used at a great price. These hangers feel gentle and sturdy when being used. The color is sleek with a wonderful spin on the hanger . Your classic hanger. Have ordered before and were great. This box of hangers are a little more brittle?? But over all good. These hangers are great for the price that Supply Warehouse charges. I manage two retail stores where I use these hangers. They are pretty strong and I hardly ever have any issues with them. They are definitely the hangers that I re-order every time I need some. These hangers were exactly what we were looking for. Great deal at a great price.